Posted on August 7, 2015 by Dayna B. Our last hike in Banff National Park was not quite what we had expected. 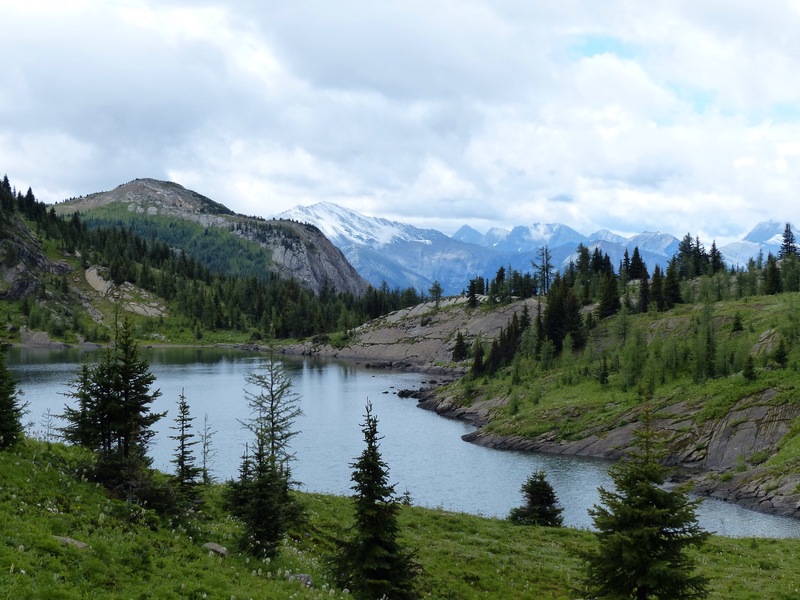 Sunshine Meadows was rated the #1 hike in ALL of Canada by Lonely Planet. Canada is a huge country, so if this was supposed to be the best hike in the entire country (not just Banff National Park), well then my expectations were pretty high. To begin the hike, we arrived at the Sunshine ski area and parked our car. From here you have two options. You can either, a) hike more than 3 miles uphill just to get to the beginning of the trail, or b) take a shuttle to the trail center. Option A would add about 90 minutes (one way) to our hike. Option B cost 27 CAD per person. We chose option B, but I think 27 CAD for a 3 mile drive is highway (a.k.a. trail) robbery. Once the shuttle bus dropped us off at the trail center, we started our hike uphill via the Rock Isle Trail. 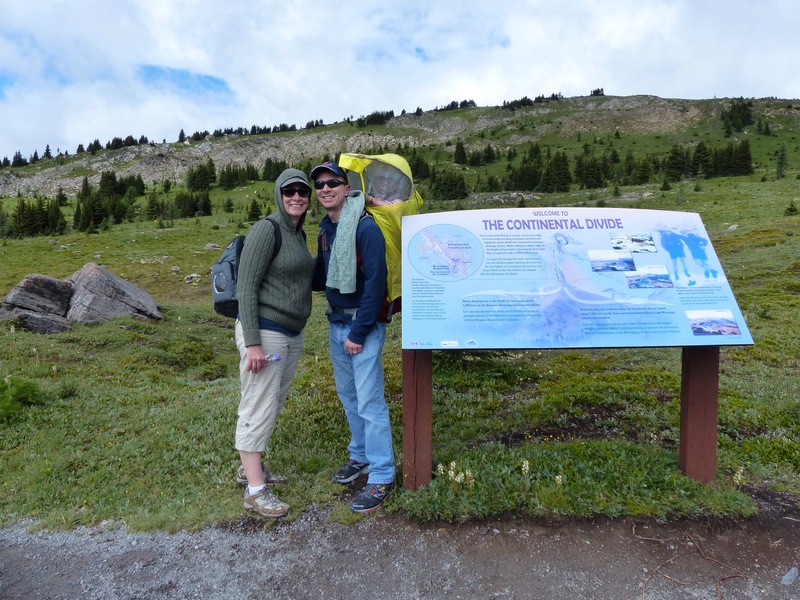 About 1 kilometer into the hike we reached the Continental Divide. At this point we had officially left Alberta and crossed into British Columbia territory. Another ½ kilometer and we had reached Rock Isle Lake. Our initial plan was to continue on this trail which would have led us to Larix Lake and Grizzly Lake. 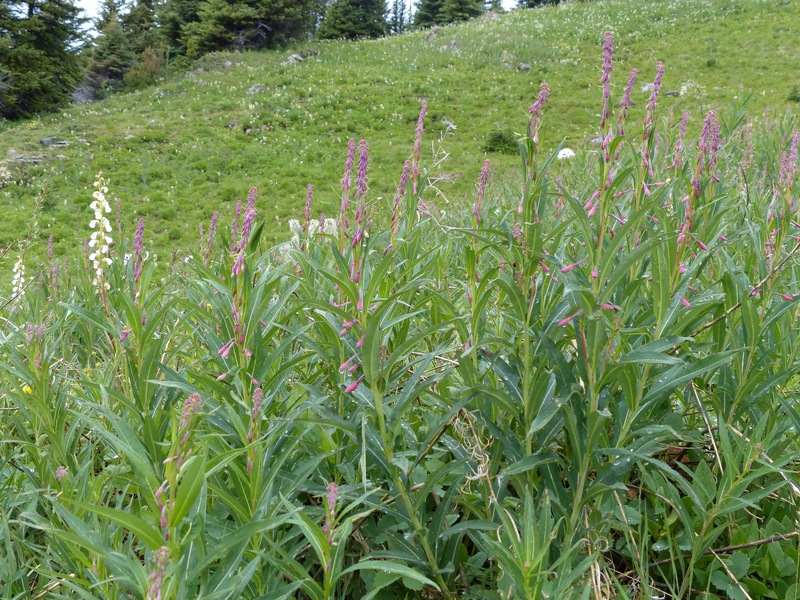 However, we were ill prepared for the Canadian “summer” weather of Sunshine Meadows. 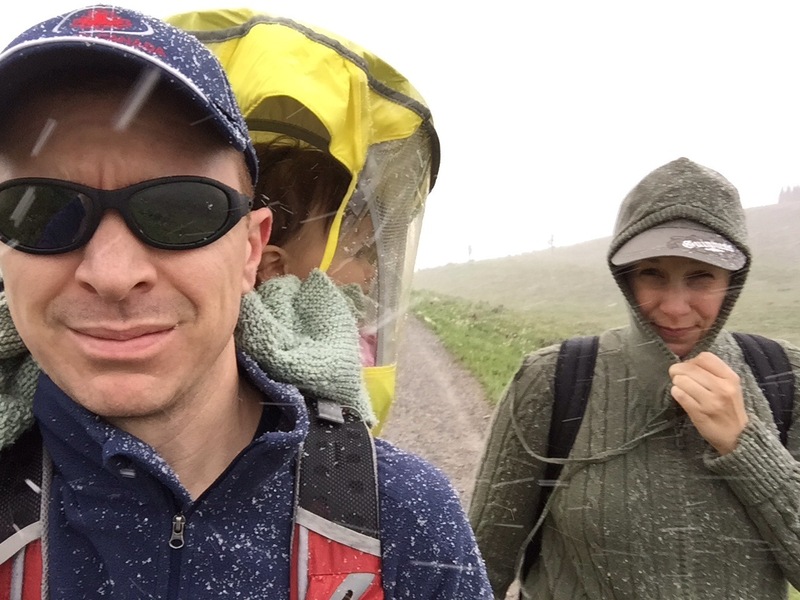 Even though it was mid-July, we encountered both sleet and snow and none of us were dressed appropriately for inclement weather. Luckily, our hiking pack for Ella has a built in weather shield, so we were able to keep her pretty well protected from the elements. But, it was still much colder than we had anticipated, so we had to end our hike early and head back to the trail center to catch the next shuttle down the mountain. 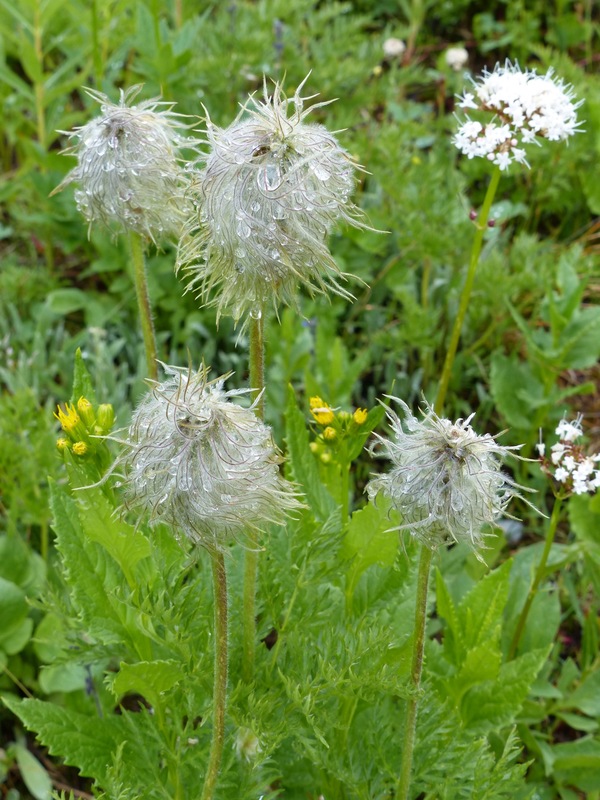 During the summer, Sunshine Meadows is said to be carpeted with alpine wildflowers. 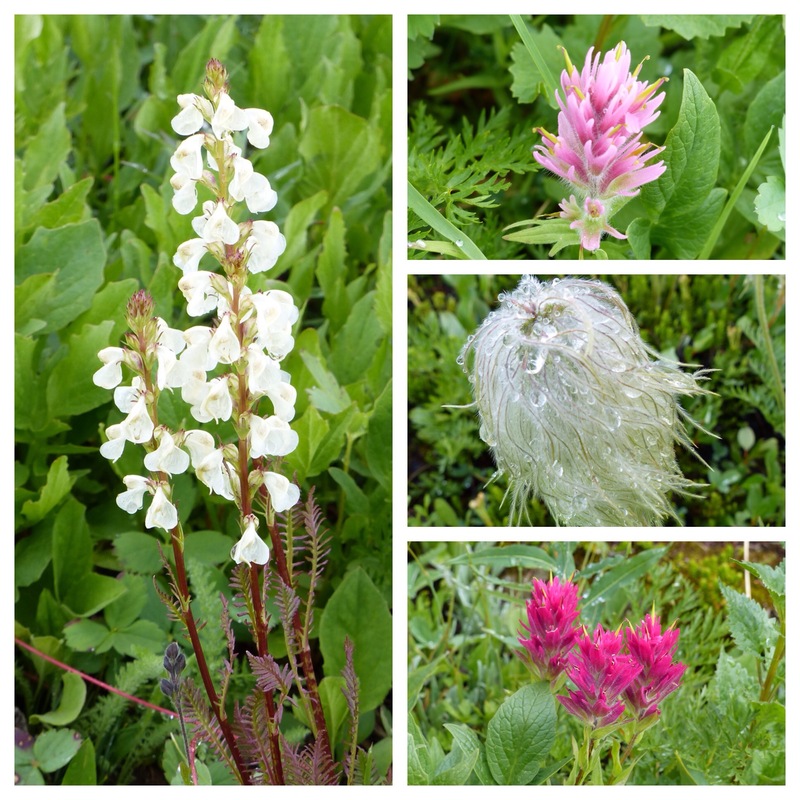 While we did see some alpine wildflowers, “carpeted” is an exaggeration to say the least. It was more like a few patches of small throw rugs! 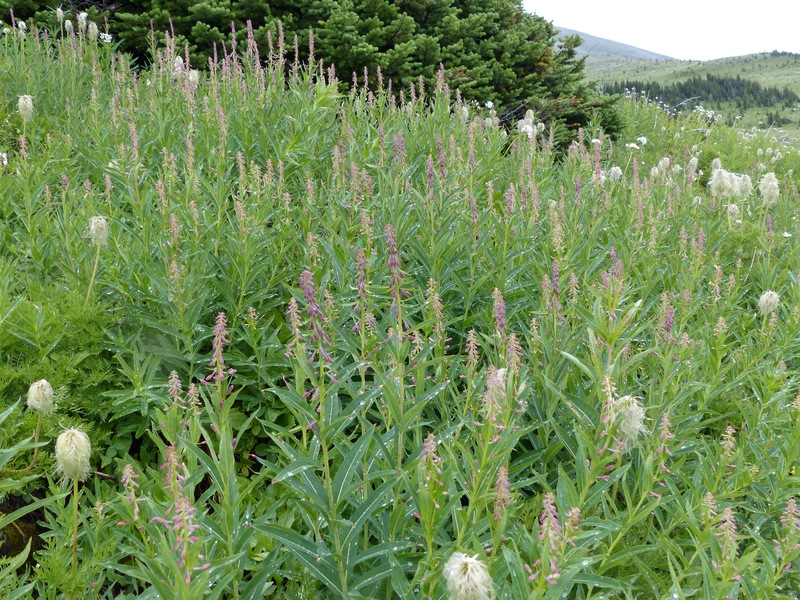 There were some wildflowers that looked like they were waiting to bloom, but I think it was just too cold so we didn’t get to see their true potential. I am disappointed that I didn’t get to see the masses of beautiful flowers that might have been on a warmer day.